Branching gives you the powerful ability to jump/skip over Pages based upon the user's answers to designated Attributes or Samples. Branching is also commonly referred to as Skip Patterns, popular with Consumer Insights professionals and Market Researchers. Branching is EASY. Follow the steps. See print screen below. Test your branch in Questionnaire Preview and/or during your Test-Your-Test. Page 1 is a  Gender question,  What is your Gender? Female or Male  (2pt category hedonic). Page 2 is all questions only for females. If Male is answered, then you want to BRANCH from Page 1 directly to Page 3, ie skip page 2. Branching is EASY. Follow the steps. FROM Page:  The page where the branch skip event originates. This page does not have to be on the same page of the Branch Condition. This page can be on or after the page of the Branch Condition. FROM Page = 0   Allowed only when branch based on Relative Sample #, Absolute Sample #, or Rep #. Provides a way for multiple rep tests, to easily skip the first welcome/demographic page(s) when Rep >=2. 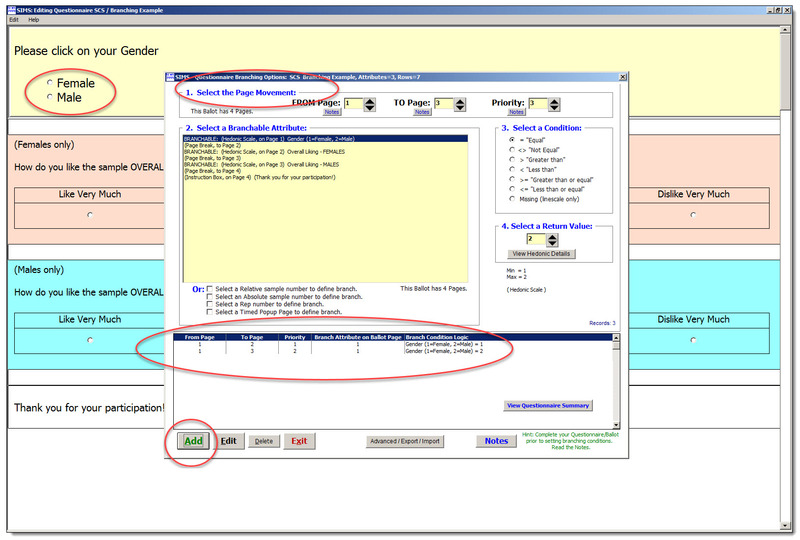 Build date note: Your SIMS Panelist PCs must be running SIMS build date April 2014 or later to see this branch rule. TO Page:    The page where the branch brings you to. This page has to be any valid page after the From page. think of the To Page as the landing page for the skip to go to. Frequently this page is the last page of the ballot. 999 -  TO Page = 999 will abruptly END Test. 998 -  TO Page = 998 will abruptly go to END of Current Sample. F.A.Q. --- TO Page:    The TO: page is ANY Page in your Ballot. Priority:  Most of the time your priority value = 1  meaning you have only ONE branch rule set for your specific FROM Page. when you have 2+ or more branch rules for a specific FROM Page. in Priority order (starting with Priority=1), and executing the first TRUE condition. First True WINS. Select an Attribute:  Select the Attribute to base the branch condition on. 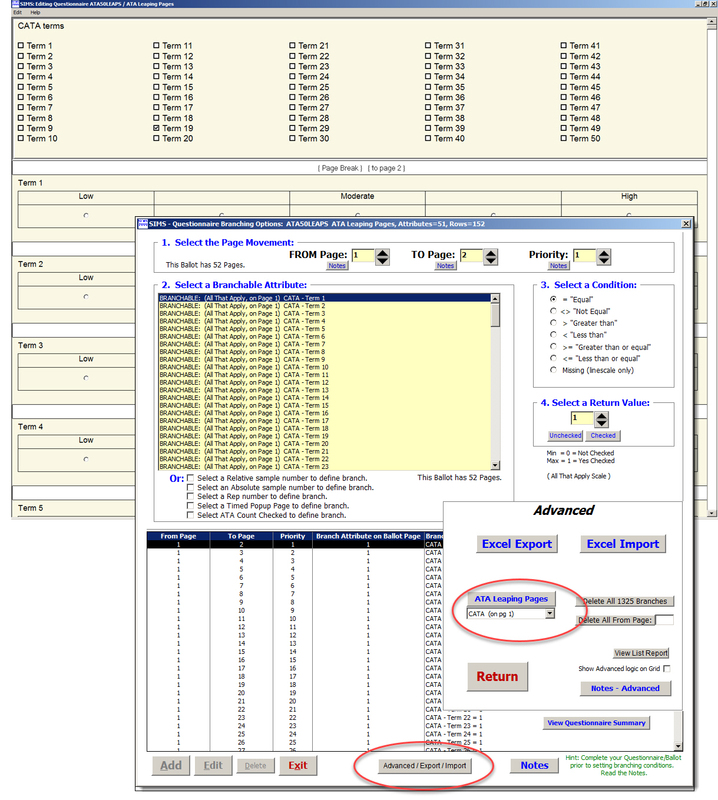 Select a Value:      The panelist entered response attribute data. Or a sample# rep#, etc. Page 1 of your ballot is your gender question:    What is your Gender? Female or Male  (2 choice category hedonic, where Female=1 and Male=2). Page 2 of your ballot is questions ONLY for the Female participants. So if Male is answered, then you want to BRANCH from Page 1 directly to Page 3, ie skip page 2. GENDER (select from list of attributes on left side of screen. Complete your entire Questionnaire/Ballot prior to setting branching conditions. 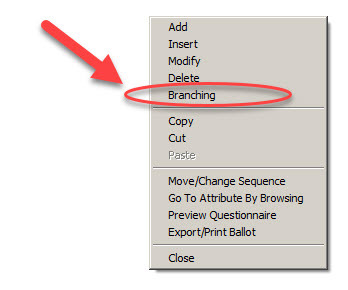 Reason:  If you later change or modify your ballot, previously set branching conditions may be lost. Setting your ballots branching conditions should be the final step. Update: some branching options can now be modified anytime via Multiple Text Edit Anytime area. Modifying/editing attributes which are basis for any branch conditions may DELETE the associated Branching Conditions. Warning will be displayed as needed. Hint:  For simple text-only changes, try the option for Multiple Text Editing Anytime. Adding OR Deleting the following Attribute Types may DELETE the associated Branching Conditions. In either case you will see a SIMS warning message/confirmation before any branch deletions occur. Hint: some branching options can now be modified anytime via Multiple Text Edit Anytime area. and should not be confused with your actual branch TO page choices on the ballot. This is why you may not see one of your Attributes and/or Page #s in the List Box. - Bi-birectional Experimental Designs are not supported with Branching Ballots. You will not be allowed to create a Test definition with this combination. - Select a Relative sample number to define branch. - Select an Absolute sample number to define branch. the panelist is currently testing, i.e. not a specific attribute response by the panelist. Relative/Absolute samples are defined in Experimental Designs. See Attribute Editing [Notes] for more information about Relative/Absolute/'Attribute Seen With'. This is similar to the 'Attribute Seen With' logic, but offers page branching. Show page 4 for every sample Except when Relative sample = 1. - Select a Rep to define branch. Reps are defined in Experimental Designs. (Version Note:  Panelists PC must have SIMS Build July 2011 or newer to use this option. - Select a Tetrad to define branch. Tetrad branch based on Correct/Incorrect panelist responses. Select   Tetrad = Correct  or  Tetrad <> Correct. Technician Note:  This Branch rule does not evaluate during ballot editing preview mode. (Version Note:  Panelists PC must have SIMS Build December 2014 or newer to use this option. These are special Advanced Branching conditions, where the condition is based on the current TIMER. FROM/TO = Skip Pages ALWAYS,  Except:  At Time Seconds,  automatically Popup Page FROM + 1. (Version Note:  Panelists PC must have SIMS Build August 2013 or newer to use this option. - Branchable Attributes which are seen only with Relative Sample Order 1, or any previous samples. Relative Sample Order 1 and is later referenced in Branch Logic attempts for sample presented >=2. Triangles, DTR, DTC branch based on Correct/Incorrect panelist responses. PC and PCN branch based on the sample # selected, or No Preference. TRI, DTR, DTC can only be tested with a real running test where correct/incorrect can be evaluated. Excel Export:  Formatted report ready output to Excel, 4 columns. Branch Condition View text content is the Attribute Export Label from Questionnaire. For ATA & Grouped Intensity the content is Export Label + ' - ' + Sub Choice text. Excel Import:  Ability to prepare branching logistics in Excel for importing into SIMS. Advanced. Use Excel Export examples as a guide. The 4 columns must be logically correct. The Branch Condition View text in column 4 is the most tricky. Import will carefully evaluate & validate all of the rows (clipboard) intended for import. If validation is successfully the import with proceed automatically. Imported Rows are first evaluated for FROM page and Priority value. This determines if your row is a new ADD or a EDIT to an existing row's FROM Page & Priority. Adds and Edits are both support. - Open your Excel file with existing Branching Information. - Select (highlight) just the Branching Rows and 4 Columns. - Copy to Clipboard (use Edit Copy, or CTRL-C from within Excel). from ballots for use in other new related ballots, assuming consistent attribute export labels are used. for every ATA choice possibility with branching to consecutive pages while leap frog'ing as needed. Many rows of branching will automatically be created, depending on number of ATA choices (n), n(n+1)/2 + n , same as  n+(n-1)+(n-2) + n.
Branch Rows to be created:  5 ATA choices 20 rows, 10 choices needs 65, 50 choices needs 1325, etc. 1 page is for the ATA attribute, 1 page for each ATA choice to branch onto, and a final page after. Pages needed:  5 ATA choices will need 7 pages, 10 choices needs 12 pages, 50 choices needs 52 pages, etc. The ATA choices *must* all have unique choice text. Example ATA with an export label = CATA  and  with 5 choices labeled Term 1, Term 2, Term 3, Term 4 and Term 5. Special Case:  Except a choice which STARTS with the word:  None         Such as:  None of the Above. A 'None of the Above' choice is found at the last choice of your ATA. Question:  Is there a specific leap-to page for to show *only* for this 'None' choice? We recommend you say [No] here unless you do indeed have a specific page for 'None'. Delete ALL nn Branches:  Proceed with caution. Will delete ALL branch logistics for current ballot. Delete All From Page [N]:  Proceed with caution. Will delete FROM Page branch logistics for current ballot.